If you own a yacht and you would like to earn some extra money or just cover some costs the ideal way of doing it is to put your yacht in Orvas Yachting yacht charter fleet based in ACI Marina Split. Yacht charter management program consists of different activities such as: find a berth for the yacht in a marina, maintance of the yacht, booking, welcome of the clients and all administrative services in the base. On this way we give yacht owners greater safety, enjoyment and peace of mind. Orvas will include the vessel in its charter catalogue, market it on domestic and international markets, provide a central booking service and ensure maximum use of the vessel by clients. Orvas will carry out all services agreed upon, such as cleaning, servicing and repairing of the above mentioned vessel, according to the following items. Before the first charter period, Orvas will inspect the vessel and establish whether it meets the standards required to accommodate passengers for several days. In case that upgrades are required, a written report will be provided of all necessary work, along with an explanation of regulations, requirements, costs and the manner in which the works will be carried out. 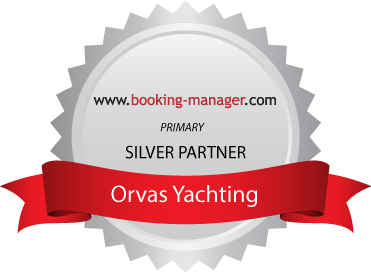 During summer (charter season), Orvas will examine the vessel after each charter period. This includes examining the underwater hull, the state of the engine, the state of the navigation equipment and the vessel's inventory. Orvas will arrange all necessary repairs and servicing and advise the Owner of their findings and required repairs. Upon return of the vessel from a voyage, Orvas is obliged to clean the entire vessel, as well as - once a month - the water line with a brush and a sponge, using a dinghy. Should the Owner make private use of the vessel, the Owner is obliged to thoroughly clean the vessel and to provide a diver or pay Orvas the amount of € 100.00 - € 120.00 to have Orvas cater for the cleaning and a diver. At the end of the season, the vessel will be thoroughly cleaned, including the space under the floor boards. The propeller blade will be covered with sponge or textile, or placed in storage. The sails will be removed, washed and folded. The vessel will be aired (weather permitting). The vessel will be washed and desalinised once a month, including the dinghy (unless it has been folded and stored). The engine will be started twice a month and the battery checked. Assemble the vessel’s equipment and ensure the integrity of all vessel functions and parts. Once a year, all teak (wood) surfaces will be re-varnished (material to be supplied by the Owner of the vessel) and the sides polished. Twice a year, all stainless steel guard rails and stanchion bases will be polished. Work done on the underwater hull during antifouling. The Owner will equip the vessel according to the annexed inventory list, ensure the vessel's technical integrity along with all accompanying equipment and ensure that the vessel's status and ownership are complete and accurate. The vessel must be fully equipped for sailing and accommodation for several days, including a full tank of fuel and all equipment required by regulations.